By 7 August, a fragile truce was established as ISIL forces also retreated from the town and redeployed along the border with Syria. Their hideouts there were subsequently bombed by the Syrian Air Force, resulting in dozens of wounded militants. On 22 July 2017 huzbollah controlled 90% of jroud arssal. Two days later, the Lebanese Army entered Arsal in full force and re-established control over checkpoints that the militants had previously seized, while another soldier died of his wounds, bringing the military death toll to 18, which was updated to 19 by 12 August. 60 militants were also confirmed dead, as well as 42 civilians. The total number of civilians wounded was estimated at 400. ^ a b "ISIS commander killed in Arsal clashes: report". The Daily Star. Retrieved 22 August 2014. ^ a b "Lebanon: Islamist militants threaten to reinvade Ersal unless conditions are met". Al Akhbar English. 7 August 2014. Retrieved 22 August 2014. ^ "Hezbollah prepares major offensive against ISIL". ^ a b c "Kahwagi: Army will do utmost to free hostages". The Daily Star. Retrieved 22 August 2014. ^ "Captured soldiers: They will kill us, if Hezbollah remains in Syria". 23 August 2014. ^ a b c d Dziadosz, Alexander. "Lebanese army advances in border battle with Islamists". Reuters. Retrieved 22 August 2014. ^ a b c Holmes, Oliver (7 August 2014). "Militants pull out of Lebanese border town with captives". Reuters. Retrieved 22 August 2014. ^ a b "8 Lebanon soldiers killed in Syria border clashes". Channel NewsAsia. 3 August 2014. Archived from the original on 15 October 2014. Retrieved 22 August 2014. 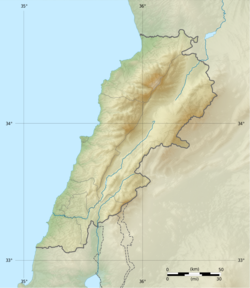 ^ "Jihadists Extend Control Into Lebanese City". New York Times. 3 August 2014. Retrieved 22 August 2014. ^ a b Mariam Karouny; Tom Perry (6 August 2014). "Ceasefire agreed in Lebanese border town battle". The Star. Retrieved 22 August 2014. ^ "11 soldiers, 30 militants killed in east Lebanon". The Daily Star. 3 August 2014. Retrieved 22 August 2014. ^ "Lebanon suffers heavy losses in clashes with jihadists near Syria". AFP. 3 August 2014. Retrieved 22 August 2014. ^ a b "Lebanon army advances against militants, death toll rises". The Daily Star. 4 August 2014. Retrieved 22 August 2014. ^ "Thousands flee as Lebanon battles Syrian militants". Associated Press. 4 August 2014. Retrieved 22 August 2014. ^ Dziadosz, Alexander (3 August 2014). "Lebanese army tries to expel Syria-linked militants from border town". Reuters. Retrieved 22 August 2014. ^ "Residents flee Arsal amid heavy clashes". The Daily Star. 3 August 2014. Retrieved 22 August 2014. ^ "Border Fighting Intensifies Between ISIS and Lebanon". New York Times. 4 August 2014. Retrieved 22 August 2014. ^ a b "Truce collapses, clashes renew in northeast Lebanon". The Daily Star. 5 August 2014. Retrieved 22 August 2014. ^ "Deal reached: ISIS to leave Arsal, soldiers to be released". The Daily Star. 6 August 2014. Retrieved 22 August 2014. ^ "Sunni fighters, Lebanese army extend fragile cease-fire in border town". Al Jazeera America. 6 August 2014. Retrieved 22 August 2014. ^ "Refugee convoy leaving Arsal stopped at border". NOW. 7 August 2014. Retrieved 22 August 2014. ^ "Lebanese Army enters Arsal in full force". The Daily Star. 9 August 2014. Retrieved 22 August 2014. This page was last edited on 3 September 2018, at 21:20 (UTC).